With regular care and maintenance, your Futrus® products will provide a lifetime of service. The instructions for the care and maintenance of Futrus® furnishings are provided as a service. No warranty is implied since results may vary. 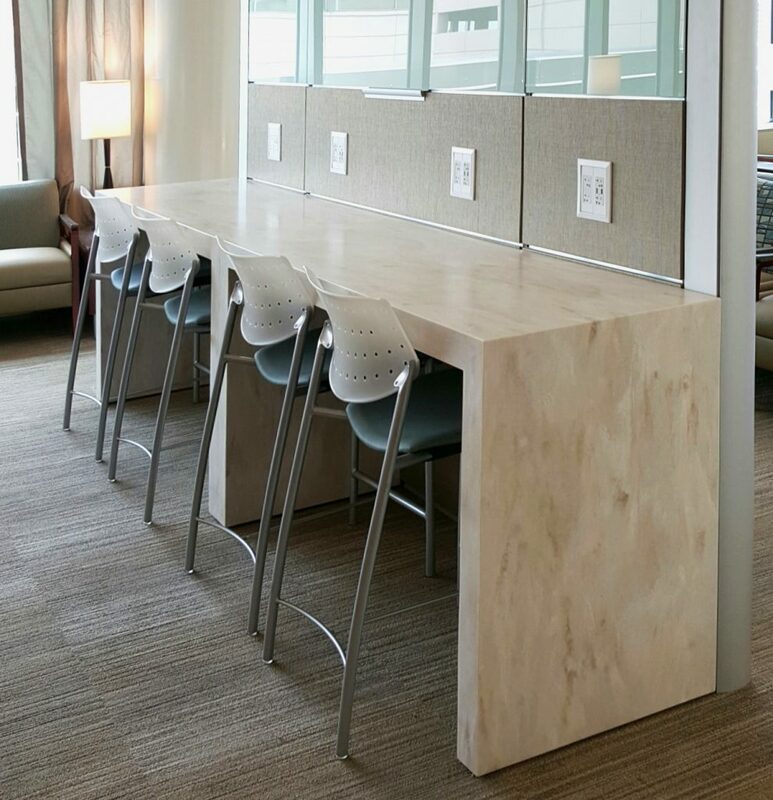 Futrus® products are constructed of DuPont™ Corian® solid surface. Just follow the simple guidelines listed here to help you keep your Futrus® products looking fresh. Our furniture is finished with a matte/satin finish. Soapy water, ammonia based cleaners (not window cleaners as they can leave a waxy build up that may dull the surface) or commercially available solid surface cleaners will remove most dirt and residue from all types of finishes. Stubborn residue will require a little stronger cleaner. It is very important to wipe the surface completely dry after spills and cleaning. Some colors of Corian® may require more frequent cleaning to maintain a uniform finish. Darker colors tend to require more attention than lighter colors. Over time, even with proper care, your surface will acquire a patina, changing the appearance of the finish. You may restore the look of the original finish by thoroughly rinsing and wiping your furnishings completely dry after cleaning. Rinse and wipe completely dry after cleaning; clean up spills before they dry. Use cleaner formulated for removing hard water marks, such as CLR® or Lime-A-Way®. Spray residue with Deep Cleaner for DuPont™ Corian® from Stone Care International. Follow instructions on the bottle. If residue persists, repeat process. Wash area with soapy water, rinse and wipe completely dry. If residue persists, follow steps below for removing dulling film. Occasionally wipe surface with dilute household bleach – 1:100 (5 Tbsp. of bleach to 1 gallon of water. As recommended by the Centers For Disease Control and Prevention for disinfection of surfaces.) *Avoid getting the bleach solution in your eyes or on bare skin. Always follow the bleach manufacturer’s safety instructions when working with bleach. While DuPont™ Corian® is heat resistant, as with all solid surface materials, it is important to minimize direct heat exposure to protect your surface and investment. Do not place hot pots, pans, etc. directly on the surface. In most cases Corian® can be repaired if damaged. Be sure to follow these guidelines to help you prevent permanent damage to your Corian®. Avoid getting strong chemicals, such as paint removers, oven cleaners, etc., on your Corian®. If a spill does occur, promptly flush the surface with water to fully rinse off the chemical. • Pour some mild abrasive liquid cleanser, such as Soft Scrub®, on a damp sponge or cloth and rub over area using small circular motions, from the front to the back, then side to side, overlapping the circles until the entire area has been cleaned. • Thoroughly rinse the top with clean water and wipe surface completely dry. • Check to see if blotchiness is gone. If not, repeat procedure applying more pressure on the sponge or tag. • Continue over all affected areas until all film is removed. Note: While this procedure may remove or minimize the look of very fine scratches, other deeper scratches may remain. They may be removed by following the procedure below or contact Futrus® customer service at 1-877-FUTRUS1(388.7871) to inquire about getting a quote for refinishing. Because the solid beauty of Corian® goes all the way through, DuPont™ Corian® solid surfaces are renewable. You can remove minor cuts and scratches yourself by following these instructions. • First, wash the area where the scratch is located, following the instructions found in this guide, to remove any film on the surface as this film may clog the cleaning pads. With the surface still wet, start rubbing with the peach colored side of the abrasive pad. Use a light touch. Pressing too hard may actually leave deeper scratches. Rub over the scratch using a straight line motion. Periodically switch rubbing direction ninety degrees. Rinse pad periodically during this process to remove any built up residue. Be sure all of the scratch is removed. • Clean surface with water and dry thoroughly. Check to see if sanded area blends with rest of top. Please note that sanded area may not perfectly match remainder of top. If necessary, turn pad over and repeat process. Rub over a large area to blend in sanding. • If needed, continue the sanding process using the Aqua colored pad and if necessary the gray color pad until the desired gloss level is achieved. • Rinse out all pads used and allow them to air dry before putting them away.